Entertainment Earth Convention Exclusive! This follow-up to our first Venture Bros. Tin Tote Gift Set (with Rusty Venture and Jonas Venture Sr.) features an entirely new and exclusive tin tote with original artwork specifically commissioned for and designed by the creators of The Venture Bros. for this set. The tote comes packaged with exclusive fully articulated 8-inch scale EMCE action figures of Death's Head Panoply Battle Armor Monarch and Dr. Mrs. 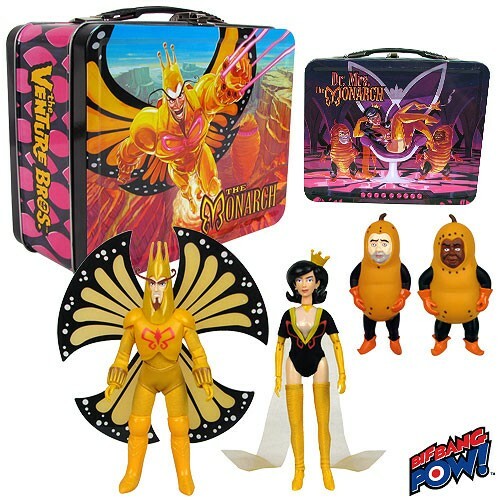 The Monarch, as well as 3 1/2-inch PVC non-articulated figurines of Tim-Tom and Kevin! 8-inch scale figures sport real fabric clothing and a 1970s retro style that accurately portrays that distinctive action-comedy mix that has become synonymous with the TV series. Ages 18 and up.